Mozilla plans to increase the number of content processes of Firefox’s multi-process architecture to four (from one) with the release of Firefox 54. Some Firefox installations are still not eligible for Firefox’s multi-process architecture. This includes systems with accessibility tools or settings enabled. Multiple processes won’t be enabled for users with extensions either, regardless of whether those are legacy add-ons, or WebExtensions. Mozilla ran its memory test again to determine the right number of content processes. An increase in the number of content processes for the browser always goes along with an increase in memory usage. Sometimes it is really easy, other times you waste your time. A good synchronization between files or folders is something you need everyday but it could become a nightmare if you miss something. In my specific case I need to automate a synchronization between a folder (F1) where I usually save my office files (Documents) with a second folder contained, for security reasons, in an encrypted volume/partition (F2). 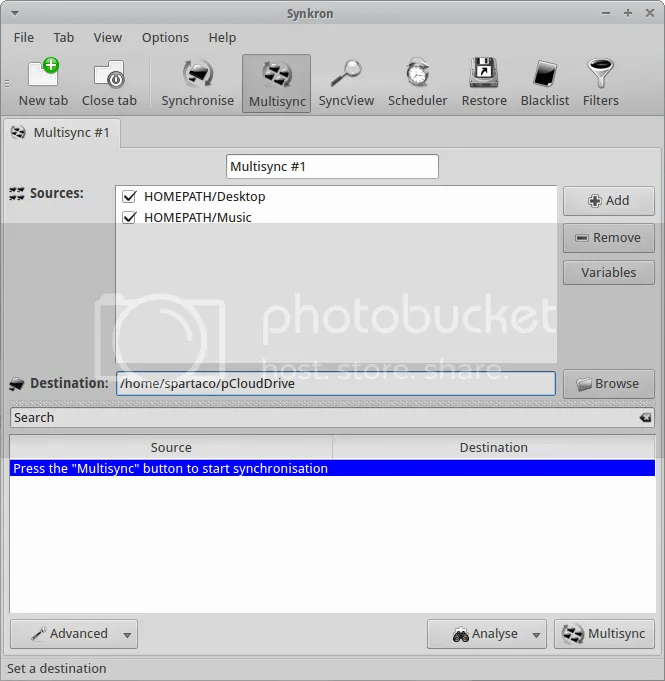 This last folder (F2) automatically synchronize its content with a third folder (F3), located in the same encrypted volume/partition, that is the client folder of a remote storage hosting (F4). This also means that when I am out of the office and I add a file in the online storage host (F4) the document is automatically copied to the client folder of the remote storage hosting and to the folder located in an encrypted volume/partition (F2 and F3). Moreover, I need to erase the Documents folder F1 as soon as it is synchronized with its mirror F2 in the encrypted volume. 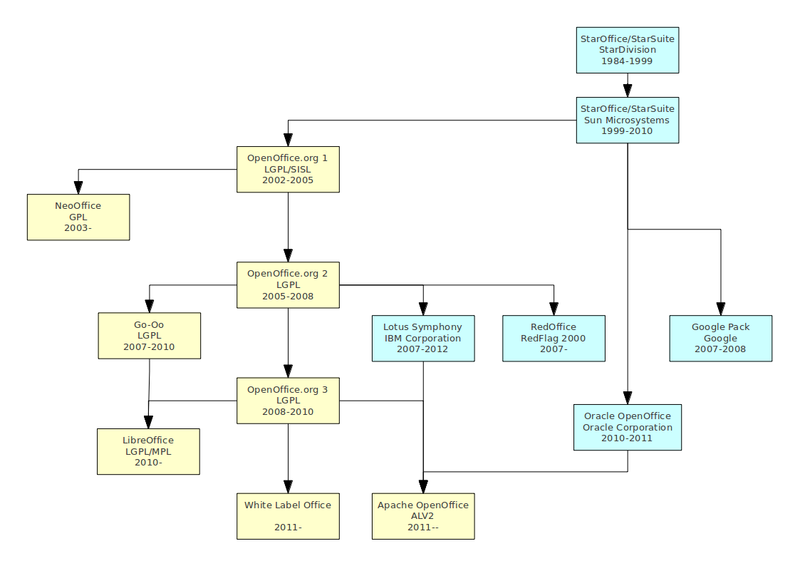 The described scenario is common in the everyday working life and it is conceptually not hard to solve… in theory… When I tried to set up the above described operations using grsync on Fedora and Ubuntu I had big problems to obtain an acceptable result. 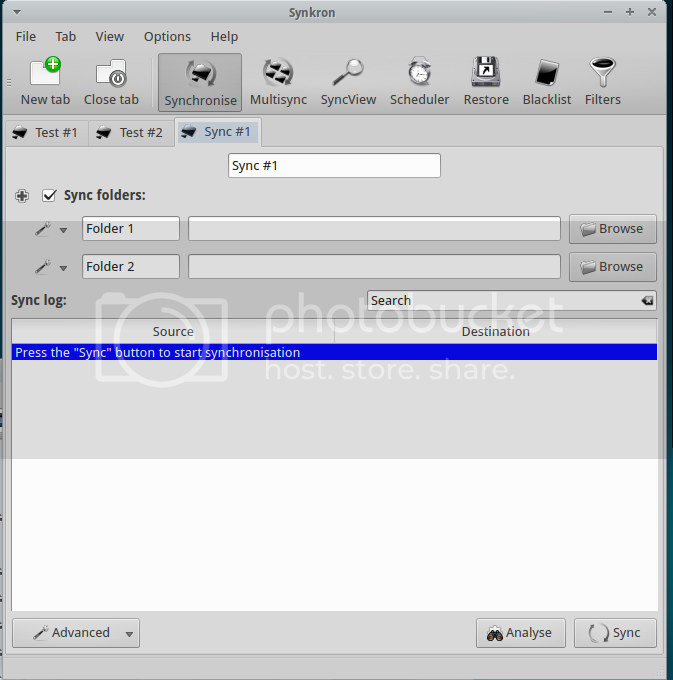 Many times the synchronization was unidirectional and I was not able to run it properly just using grsync still I found one right solution with Synkron. Synkron is a multi platform software (Linux, OSX, Windows and portable) written in C++ that is really flexible for all multitasking synchronization needs. First of all, Synkron is multi-tab and this is a winning features because it let you to “slice” any problem (synchronization matter) into simple, easy to solve, tasks. 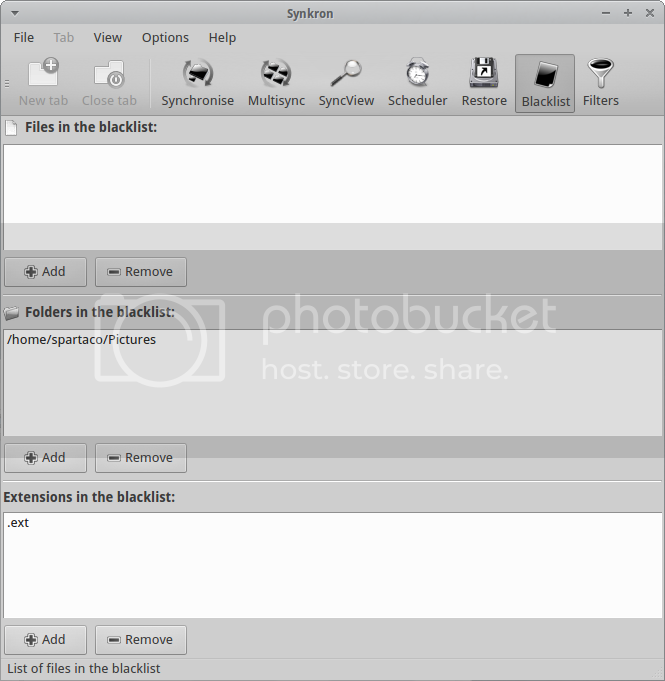 In my example I determined the two Folders I wanted to sync – F1 & F2) and decided thath both folders had to be considered as Master by the software. Then I used the Advanced Menu and I chose to “Move contents to Folder 2, leaving folder 1 empty” and to “Store database in a text file” for my convenience (F1 to F2 deleting F1 contents after synchronization). At this point, I opened a second synchronization tab where I selected two folders (F2 to F3 sync) and I also asked Synkron to “Synchronize hidden files and folders” and to “Detect collisions”. At this point I had obtained an acceptable solution to my initial task, simply dividing my problem into two separate operations. 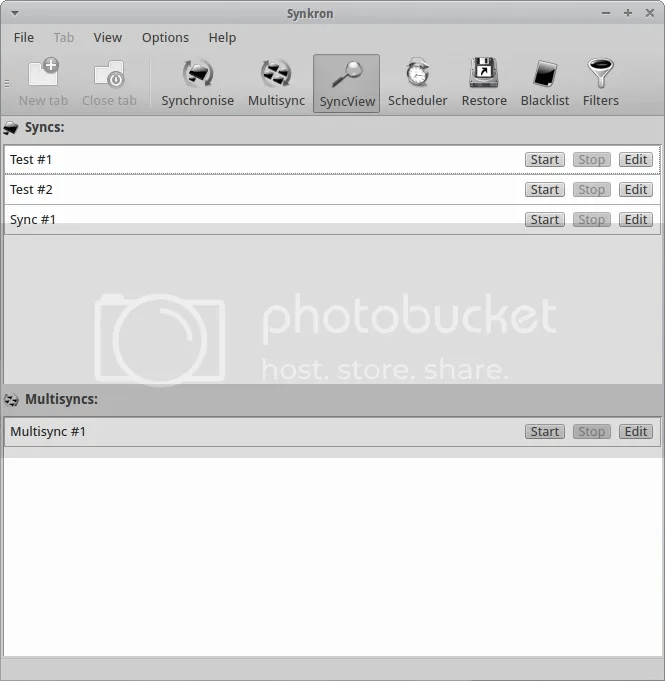 Moreover, I’ld like to focus your attention on the fact that Synkron has a specific feature for multi-synchronizing three or more folders at the same tome. The tuning of this particular feature is really intuitive and you can also selected many of the different advanced options we described here above. 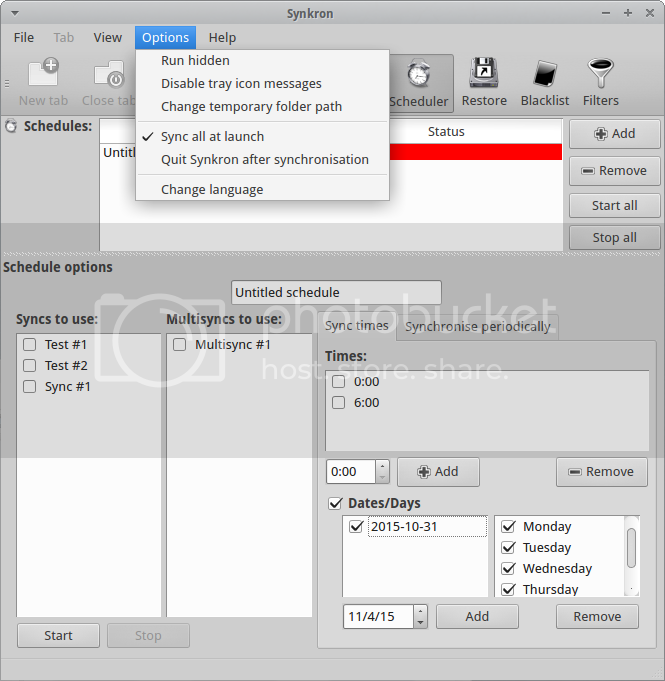 If you have complex synchronization needs and you have many tabs configured you can always choose what tabs you want to activate or deactivate using the “Sync folders” option you find in the upper part of each tabs. Another option for this specific issue is represented by the SyncView visualization that let ypu to have a quick general glimpse about the state of all the sync and multisync tabs. Synkron has simply fantastic scheduling options that are able to solve any need you may have. 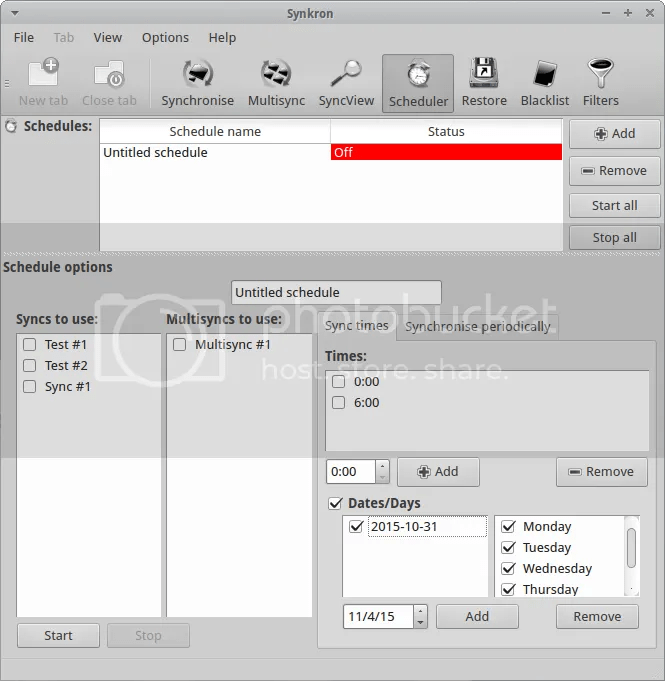 Furthermore you can decide to automatically synchronize your folder as soon as you launch Synkron. You can also decide to automatically run Synkron at the startup but, in this case, you need to manually configure your Startup Menu. 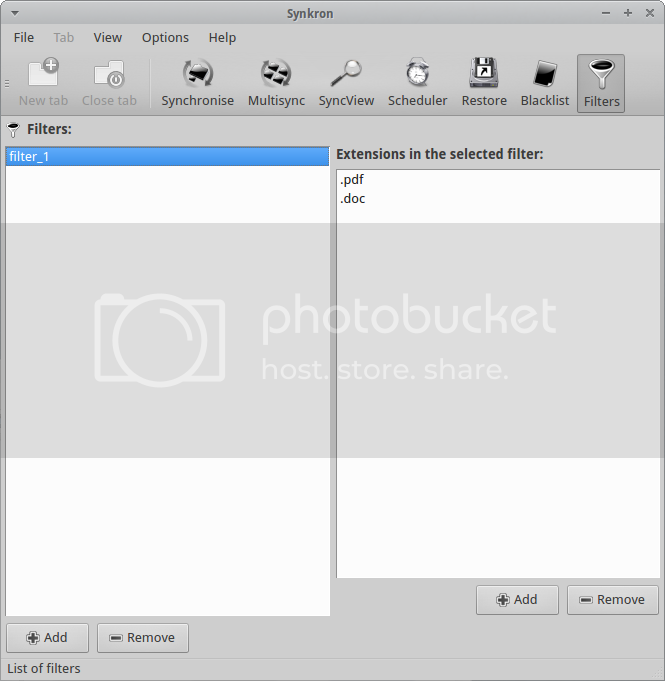 As extra features you can always decide to create Blacklists that will exclude specific files, folders or extensions from the synchronization. In addition you can define Filters by extensions to better refine your synchronization. Last but not least, when you run Synkron you obtain a detailed report in real-time where you can check the state of operations by colors. This entry was posted in cybersecurity, efficiency in Ubuntu, free software, free software download, Free Software Magazine, Freeware, freeware blog, Freeware Reviews, freeware tip, freeware tips, Linux, Linux Tips, Privacy, software for Linux, Tech, Technology, Technology and Software, Technology News, Tecnologia and tagged automate, configure, Cybersecurity, database, encrypt, folder, free software, Linux, Linux Tips, open source software, Privacy, real time, security, Software, sync, synchronize, Synkron, Technology, Technology and Software, Technology News, Tecnologia, Text file, tip, tips, tutorial, utilities, windows on November 18, 2015 by Galigio. 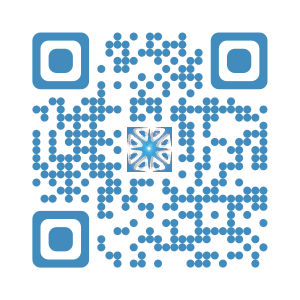 If you need to quickly modify pdf documents on-line (e.g. before forwarding them), you cannot have access to your laptop and you don’t have the Administrator privileges on the computer you are using, you could be interested on the features offered by http://www.ilovepdf.com. PRO: This website works without the need to install particular “interfaces” on your computer, it doesn’t seem to be invasive and the results, for my experience, are good. Moreover, it offers a real interesting bunch of features to “modify” and convert pdf documents. CONS: It uses only HTTP protocol and, in any case, is an “unknown third party” so remember to not share any OFYE documents with them. This entry was posted in Freeware, internet, Tech, Technology, Technology and Software, Technology News, Tecnologia and tagged Internet Tips, online, online tools, pdf, pdf online, tips, tools on August 28, 2015 by Galigio.